I always love going back to my old school. I feel lucky to have been given such a rounded and varied education and I never fail to wonder at the kindness and politeness of the girls when I return. Since September 2016, St Helen’s has been using the Paws b syllabus to introduce the girls in Year 6 to mindfulness. This started because the teachers were finding that, at just 10 and 11 years old, the girls (not to mention the teachers!) were experiencing rising levels of stress and the number of children with anxiety problems was increasing. Thus the fantastic and amazingly kind and calming teacher, Sudeep, took the initiative to bring mindfulness to the school, having experienced first-hand its benefits personally. We sat in (and participated in – much to our excitement!) a mindfulness session with the girls. Each girl knew exactly the practices they liked, from finger breathing (tracing the outline of fingers in time with the breath) to petal practice (breathing out whilst opening the palm of the hand like an opening flower, and closing fingertips on the inhale) – as well as other approaches too. It was music to our ears, to hear how the girls had introduced this into their personal lives. One shared how she had used it to keep calm whilst her mum was in hospital. Another practised mindfulness when she was angry with her brother – it helped her feel more peaceful and to realise that he didn’t mean to be unkind! Listening to the girls talk about how happy it made them, not only to receive kindness, but also to be kind to others, showed us how much of an impact these small classroom initiatives have on the whole school environment. These positive effects impacted, not only the girls, but the teachers too, some of who had introduced it into their family lives back home. For us, the special thing about St Helen’s was how neatly kindness, gratitude and mindfulness were incorporated into the everyday lives of both the girls and staff. Each girl was polite, thoughtful and enthusiastic whilst the passion of the teachers about the girls’ wellbeing was truly inspiring. We both left the school with tingles of joy and excitement. Our buckets overflowing, we became more determined than ever to share this good work. What a special morning we had! Thank you St Helens! It was such a joy to host you both at St Helen’s and share with you our determination to support the mental wellbeing of all our girls and teachers. 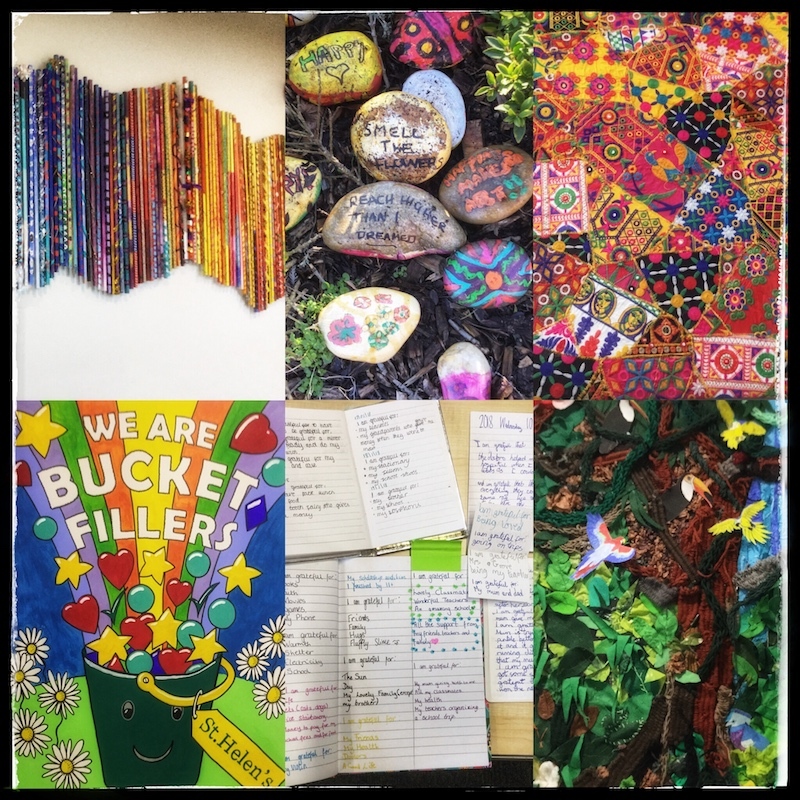 Thank you for the inspiration and validation your work gives ours – sharing our St Helen’s community with others always helps us see it with fresh eyes and replenishes the staff and girls enthusiasm. We were all buzzing after your visit! We are still buzzing too here! We very much look forward to our next catch up to see how the girls are getting on. Loads more to share.